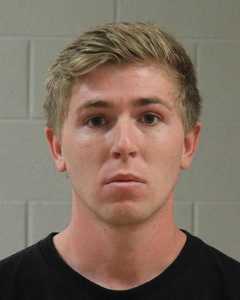 SAND HOLLOW STATE PARK — An Ivins man is facing a third-degree felony charge for allegedly burglarizing The Beach at Sand Hollow State Park. Authorities were notified Saturday of a burglary at the concession shop that had occurred overnight. Witnesses placed 22-year-old Hayden Michael Austin at the scene of the crime, according to a probable cause statement filed by the Utah State Parks and Recreation in support of the arrest. Upon further investigation, the report stated, officials confirmed through photo footage that Austin was at the park during the time the burglary occurred. According to the statement, Austin had access to a key to The Beach and knew the combination to the lockbox where approximately $360 in cash had been taken. When authorities interviewed Austin, he initially denied being at Sand Hollow the night of the burglary, the report stated. However, upon further questioning, Austin admitted to attempting to use an employee entrance to get into the park. He told officials he was with two other individuals, according to the statement, and further admitted to his involvement in the burglary. Austin was arrested and booked into the Washington County Purgatory Correctional Facility on a charge of third-degree felony burglary. Austin is scheduled to appear before Judge John J. Walton in 5th District Court Thursday afternoon for his initial court appearance.